Choose the color or colors you would like your poly furniture to be created in. Choose "regular colors," "two-tone colors," or "tropical colors," and "Natural Finish colors". UV stabilized so that the color will stay. 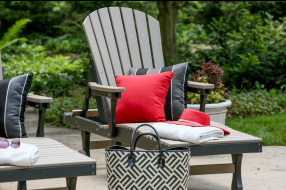 The color is through and through the poly lumber used to create your life-time outdoor furniture. ​Driftwood Gray, Driftwood Gray on White and Driftwood Gray on Black available for most furniture pieces for an additional 10%. Shown here is light gray on black. Comfo back style is available in all color choices. Direct to you in a box as a kit where you complete the assembly is $710. We are happy to complete the assembly and deliver it to you $800 if you are within 30 miles of our Magnolia or Lake Conroe stores. Natural finish colors are 10% more $796 in a box or $886 assembled. Chaise Lounges are available in two different styles: shown here in casual back with optional cushions or above in comfo back. Available in all colors: regular, tropical, and natural finish. Assembled and delivered to your deck, patio, porch, pool side, balcony, or place of your choice within a 30 mile radius of our Pinehurst and Lake Conroe store. Casual back chaise lounge $771 assembled or shipped to you direct in a box and you assemble is $681. In natural finish is $853 assembled or $763 shipped to you in a box and you assemble. Optional cushions are $230 per set per casual back chaise for the seat and back cushion in the group "A" Sunbrella fabrics; premium fabrics are a little more; cushions for the comfo back chaise is $210. See fabric choices under the "deep seating" "drop down". Berlin Gardens quality poly outdoor furniture is proud to made by the Amish in the USA! It is backed with a 20 year warranty. No need to replace your outdoor furniture ever again. This is a lifelong product. Approximated 500 milk jugs are recycled to create a piece of poly furniture. 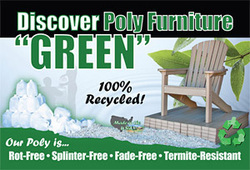 Saving the environment while enjoying the comfortable elegance of poly furniture is so much fun. Going green was never so easy and so incredibly comfortable. All products are shipped free to your door! If we are within 30 miles of you, we will assemble and deliver the furniture to you, if you choose that option or you may choose to have it sent to you by UPS or a similar carrier and assemble it using the provided instructions.